The following testimony took place between 10:12 A.M. and 10:52 A.M. on 2/27/09. The student laughed when asked by attorney R. Kelly Hamilton if he remembered his fellow students reacting when the Tesla coil was applied to their arms. “It was nothing painful at all,” Corbin Douglas Heck said. During the 07-08 school year Heck was a student in John Freshwater’s eighth-grade science class. His testimony at the February 27th hearing covered his knowledge of the Tesla coil experiment, his interaction with Zachary Dennis and Freshwater’s handling of religion in the classroom. Heck described having the Tesla coil run across his arm as feeling like “a brief tickle.” He said that it did not hurt. No immediate mark was visible, but later a faint mark did appear, Heck said. The mark that he described as being pinkish and in the shape of an “x” of “about the size of a quarter or half dollar” was gone by the time he arrived home at about 7 or 8 that evening, Heck said. Heck—who said he sat at the front of the class and was two feet away from Freshwater—did not hear Freshwater say that the mark from the Tesla coil was a cross. Freshwater first applied the Tesla coil to himself several times before asking if any of the students wanted to try it, Heck said. Of the 21 kids in the class about 12 of them had the Tesla coil applied to them, including Dennis, Heck said. Hamilton showed Heck Board Exhibits #7 and #8, photos allegedly of Dennis’ arm with burns. Heck said that he never saw marks like those depicted in the picture on anyone’s arm including not on Dennis’ arm who Heck said normally wears short sleeve shirts. Heck described himself as being friends with Dennis and that in addition to having several classes together they also have lunch together two or three times a week. Dennis never made a complaint to him about his arm being injured by the Tesla coil, Heck said. When Dennis had the Tesla coil applied to his arm, his eyes went up and he laughed, Heck said. Heck did not see Dennis pull away, cry, or that he was harmed in any manner. He did not remember Freshwater ever holding anyone’s arm down when applying the Tesla coil. After applying the Tesla coil to individuals, Freshwater asked the students if they wanted to be in a daisy chain, Heck said. (Daisy chain—holding hands and experiencing the shock of the electricity as it flows from the first person in line through to the last. Heck said that Freshwater was the first person in the line.) All but three students participated in this, no one that previously had the Tesla coil applied to their arm declined to be a part of the daisy chain, including Dennis, Heck said. Dennis never expressed discomfort to Heck about being in Freshwater’s class, Heck said. When Freshwater would call upon Dennis for questions, Dennis would answer them, sometimes Dennis would raise his hand to answer a question—Heck said he did not get any sense that Dennis was being picked on by Freshwater. Heck said that Freshwater did not teach religion in the classroom. “The Bible was never pulled out, it was under papers,” Heck said. When the students asked about Easter, Freshwater responded by saying that he could not really tell them about that, they would have to ask their parents, Heck said. Attorney for the Mount Vernon City Schools Board of Education, David Millstone, asked Heck if the word “here” was ever used in Freshwater’s classroom. Heck said that when they were reading from the textbook and they came across something listed as fact in the textbook, but was not fact, the students would say “here.” An example he gave was that if the textbook said the earth was six-billion years old, the students would say “here” to indicate that the date given was not exact or necessarily fact. Heck said that prior to this he had never seen the film. He described it as being something that was unique enough—about a watch and lava—that he would have remembered watching it. When under cross examination by Millstone, Heck admitted that he had missed about a week of school last year. The Mount Vernon News website on Wednesday, February 25, posted a headline stating the John Freshwater contract termination hearing had been delayed again: "The hearing originally scheduled to resume this Thursday has been postponed until Friday, February 27." Following the previous delay in the hearing, when the testimony was still scheduled to resume on Thursday, I contacted Don Matolyak, media contact person for John Freshwater. “All I can say about the delay is that there is some 'legal wrangling' taking place after a day of depositions for the federal lawsuit (brought by the Dennis family against John, the administration and the BOE) took place on Monday,” Matolyak said. Rumors that the hearing was being delayed due to settlement talks are not correct, according to information supplied by Matolyak. Matolyak also said that attorney schedule conflicts were involved in the delays of the hearing—he may have been referring to how the hearing has been drug out over several months with only occasional days when testimony is actually taking place. “There are several attorneys involved besides Kelly including: Mr. Millstone (School Board), Mr. Shepherd (Referee), Ms Philemond (Dennis Family), and two insurance attorneys,” Matolyak wrote. 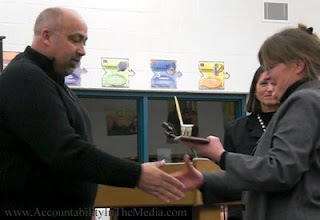 In the midst of the controversy surrounding the Mount Vernon Middle School and its suspended teacher John Freshwater, the school principal gave a “Behind the Scenes” award to the education reporter from the Mount Vernon News. Principal Bill White presented the award during the Mount Vernon City Schools Board of Education meeting on February 2, 2009. “Actually, its kinda funny to give a ‘Behind the Scenes’ award to the person who is out in front of everything that is going on,” White said. Schehl wrote the article for the News covering the school board meeting. She has also written many of the articles for the News about the Freshwater controversy. The Mount Vernon News reports that Schehl is a finalist in the Associated Press Society of Ohio’s 2008 newspaper competition: “Pam Schehl, Best Breaking News for her articles on the Freshwater controversy.” The winners will not be announced until May 3.